Listening to the financial news this week gave the impression that just a whole lot of stuff was happening. Really? No. For the week (Friday close to Friday close): S&P 500 +0.32% ; NASDAQ -0.79% ; Europe +1.24% ; China -1.73% and Japan -1.93%. A mixed bag I’ll say. The European exchanges did well, but have been volatile as of late, the US exchanges mixed and the Asian exchanges behaved poorly. So where on earth does this market go from here? Likely to stay in a trading range as outlined on the chart above (NASDAQ Composite Index; click on picture to enlarge it). The price levels shown in purple are a range where it’s just hard to punch through. 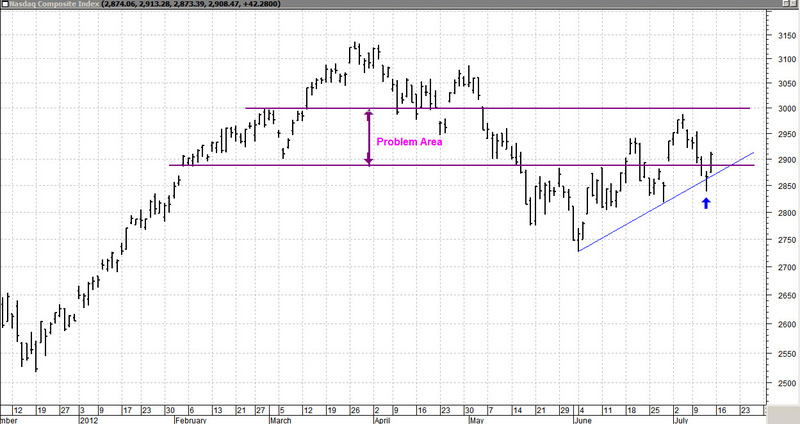 We’ll call this the Problem Area. You can see that it’s been forming all the way back to the early part of this year. This market is great for traders who thrive on cyclical ups and downs but it has not been trending in either direction for very long. One could say that this action is typical for summer, and that’s fairly true, but there’s more to it than that. This market is indecisive. It can’t make up its mind if the glass is half full or half empty. So . . . it just oscillates back and forth. Something will get it to move. Likely news, either good or bad, but it will move someday. Let’s look at how stocks are behaving as a whole. 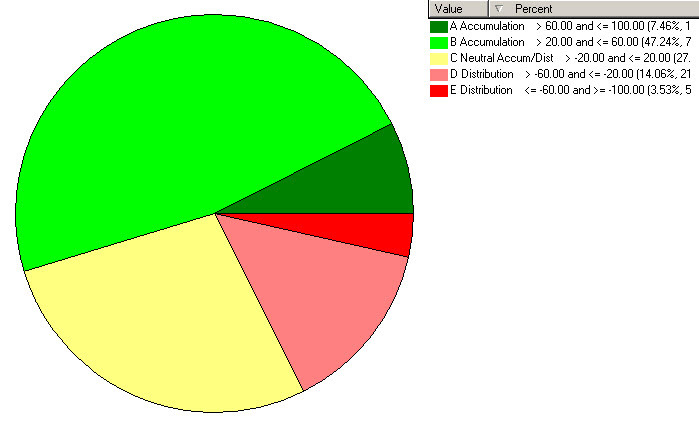 The pie chart above is of the stocks in the S&P 1500 Index. Green shows the number of stocks in some form of Accumulation (money flowing in), Red is Distribution (money flowing out) and Yellow is Neutral. So far the Greens have it but the yellows are growing. Back to indecision? Perhaps, but at least we’re not seeing wholesale selling. There will NOT be a posting next weekend . . . the first one I’ve missed in a year and a half. Vacation plans. But please be watchful. Things can change quickly. charts courtesy of MetaStock and www.HighGrowthStock.com; used with permission.